View Talay 1 is a popular and classic condominium in the middle of Jomtien and right on the baht bus route with easy access to local amenities, Jomtien Beach, restaurants, mini-marts and entertainment venues. 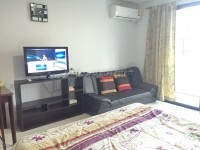 This 32 m² studio unit is situated on the 13th floor and sold/rented fully furnished. It comes with kitchenette, A/C unit, bathroom with hot water shower and balcony with sea views. View Talay 1 has 24 hour security, key card access, children's playground, large communal swimming pool, restaurants, laundry service, plenty of car/motorbike parking and several shops on the ground floor. Rental of 6 months at 11,000 Baht per month or 12 months at 10,500 Baht per month.